In case you're wondering who on earth PS3 are, we thought we'd introduce ourselves and tell you a bit about our role. We work in school, as a team, to support our children's mental health and well-being in a friendly and approachable way. Besides being on the staff, we're all mums ourselves so understand the things that bother children on a day-to-day basis. Research has shown that children with mental health or emotional challenges are less likely to engage with their learning, so our aim is to build self-esteem and promote confidence to enable children to do just that. Children with worries can place a slip in the Worry Bucket and one of us will respond, in confidence, offering suggestions as to how to deal with the problem or simply be a listening ear. 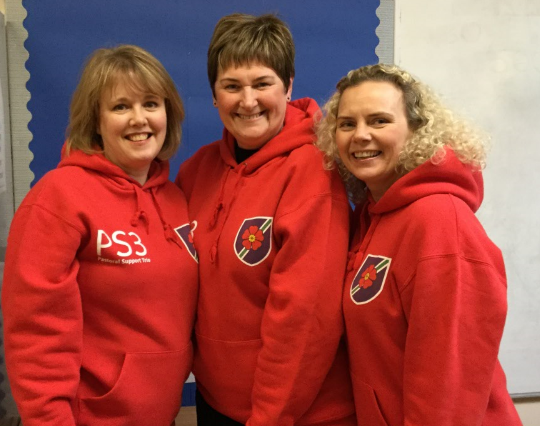 Children can also just come up to one of us and ask to have a chat - we can be found at lunchtimes wearing the PS3 red hoodies ! A member of the team is on duty every day. Parents are also welcome to contact us (see below). Parents are more than welcome to contact us if you feel we could support your child. * Complete the PS3 Contact Form by using the "Contact us" link below.